OSCC have adopted the design opposite as their Club Badge. This is the coat of arms of the present 16thEarl of Westmorland (Anthony, David, Francis, Henry Fane) born 1951. 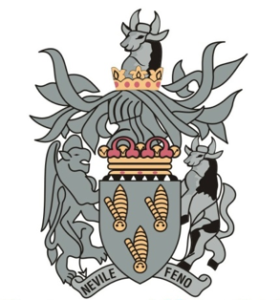 The motto is a play on names (Neville & Fane) the Latin “Ne Vile Velis” means “Form no mean wish” or literally “Do not wish for something cheap” but generally rendered in English as “disgrace not the alter” or “Do not put something cheap in the temple”. 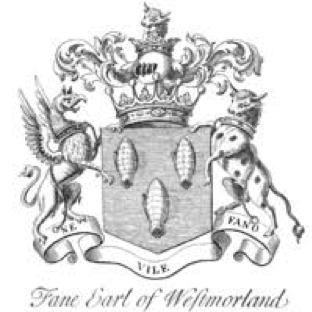 The one below is the coat of Arms of the 1stEarl of Westmorland; Second creation (1624) Francis Fane (1580 – 1629). The 6thEarl Charles Neville, forfeit the status in 1571 because of his involvement with the house of York and the house of Lancaster against Queen Elizabeth I. The 1stEarl of Westmorland; Second creation was granted to Francis Fane in 1624 by King James I. The Right Honorable Priscilla Ann Dowager Countess of Westmorland (née Wellesley-Pole) married John Fane 11st Earl of Westmorland (1784-1859). She was an accomplished linguist (English French & Italian) and a distinguished artist. Her father’s brother was the Duke of Wellington. She owned most of Sharlston, Streethouse and Snydale and sold the mineral rights in 1865 to John Crossley & Sons whose company sank the mine. The area stretched from Warmfield in the north to Foulby in the south and Crofton in the west to Snydale in the east.